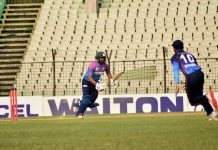 All of the four matches of the second round of Walton National Cricket League (NCL) ended in a draw as bad weather abandoned the final day of play in all the respective venues. Venue : Sheikh Abu Naser Stadium, Khulna. Player of the Match : Ziaur Rahman. Venue : Shahid Kamruzzaman Stadium, Rajshahi. Player of the Match : Liton Kumar Das. Venue : Sheikh Kamal International Cricket Stadium, Cox’s Bazar. Venue : Khan Shaheb Osman Ali Stadium, Fatullah. Player of the Match : Shadman Islam.